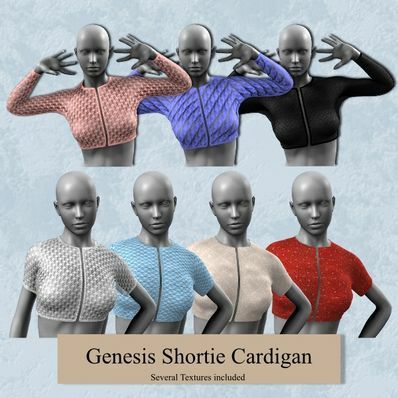 Two Cardigans for Genesis for use in Daz Studio 4. A short sleeved and a long sleeved shortie length cardigan for Genesis. Will work with most poses and shapes. There are several MAT zones included so you can change colours easily. I have also included several Textures. Thanks so much for all the added textures and MAT zones. Thinking of using these over some of your evening gowns.